80W Vaporesso Tarot Nano integrates a 2500mah built-in battery. Carrying with OMNI board chip, this mini box mod delivers huge power up to 80W. It displays a 0.91-inch OLED screen with 4 hexagonal buttons to show all of your customized settings clearly. 80W Vaporesso Tarot Nano is the compact version of 160W Tarot Pro Box Mod. It integrates a 2500mah rechargeable built-in battery. Carrying acclaimed OMNI board chip, this mini box mod delivers huge power up to 80W, and also having the new Customized Curve of Wattage (CCW) and Customized Curve of Temperature (CCT) modes adding a greater range of versatility. made of zinc, aluminum and carbon fiber, the Tarot Nano MOD displays a large 0.91-inch OLED screen with 4 hexagonal buttons to show you all of your customized settings clearly. 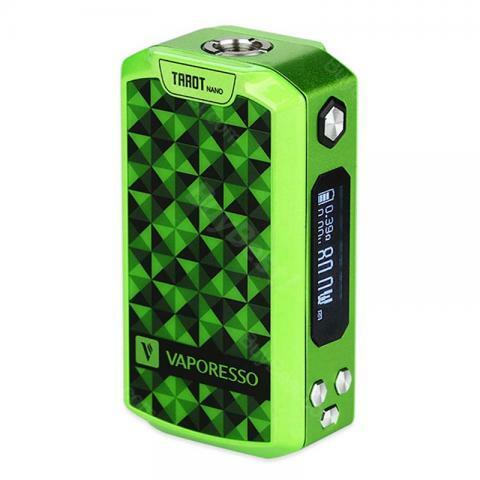 • 3 months Warranty for 80W Vaporesso Tarot Nano MOD. vape it all day and all night.Battery lasts long, just right to put it in my pocket. I LIKE this cool mod! Outstanding performance, nice mod! I will be purchasing a few more from this company. Tarot Nano, as a small vape, creates lots of clouds with my tank. SUPER GOOD vapor production!